Hats off to our hard-working, volunteer corps, the Beach Ambassadors! They put in 563 hours of work in education, stewardship and citizen science since their training started in April 2014. 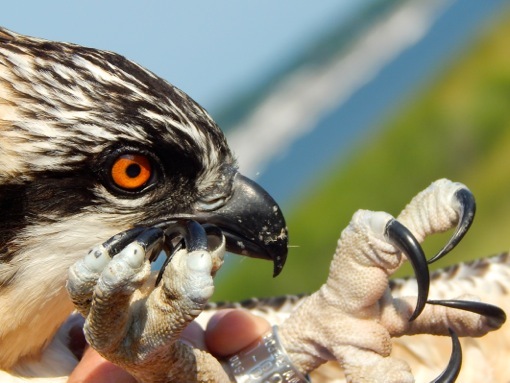 An osprey chick from the Long Beach nest with its new US Fish and Wildlife Service band. Photo by Samantha Gustin, age 11. Beach Ambassadors spread nature discovery fun and conservation education at beach programs, nature hikes and at six festivals throughout the summer and fall including Pinefest, Wildlands Trust’s Run for Conservation, Cape Cod Wildlife Festival, HarborFest, Connecting for Change, and Cape Cod Bird Festival. They also were the community host at Plimoth Plantation Farmers’ Market in July and aided in field trips to the mouth of the Eel River for Plymouth South High School’s oceanography and biology classes. Beach Ambassadors assisted in running workshops, too, such as Learn to Clam, Jam Making and Learn to Survey Shorebirds. Stewardship activities included transplanting native seedlings on Penikese Island to help restore roseate tern habitat, picking up trash from Long Beach for Hometown Cleanup in May and November, helping move symbolic fencing on Long Beach and raising beach plum shrubs from seeds (ongoing). The main citizen science project was monitoring the Osprey pairs at Long Beach and Nelson Park for the national program: OspreyWatch. With all this under their belts, the Beach Ambassadors aren’t now resting quietly. They are hosting the “Summer in Winter” program during school winter break to entertain, educate and prepare folks for next summer’s fun. You and your children or grandchildren can join them from 9 a.m. to 11 a.m. on February 18 at the Council on Aging, 44 Nook Road in Plymouth. This is a good opportunity for potential future Beach Ambassadors to check out the program and talk with current volunteers. 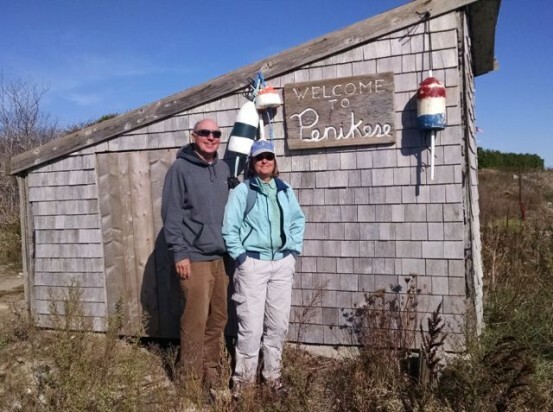 Some Beach Ambassadors are also serving as crew, support and talented presenters for Goldenrod’s winter speaker series: Making Waves in Coastal Conservation. This series will be held at the studios of Plymouth Area Community Television (PACTV), filmed in front of a live studio audience and live-streamed to Internet viewers around the world. Later, each program will be broadcast on PACTV and uploaded to YouTube. First up is Beach Ambassador and marine scientist Lindsay Hirt who will speak about our majestic offshore neighbors – the great whales – and how new technologies and people who care are making a difference in their survival. Email dss@goldenrod.org if you would like an invitation to be part of the studio audience, or tune in on Monday, January 12, from 7 p.m. to 8 p.m. EST to our Ustream channel: http://www.ustream.tv/channel/goldenrod-foundation-making-waves-in-coastal-conservation. Sign up early to get a reminder email about the program. The Beach Ambassadors are looking for new volunteers. The 2015 training begins on April 16 at 5:30 p.m. at the Manomet Public Library. Click here for the training schedule, and here for an application. Commit yourself to a summer of fun, education and nature discovery on the beach: Become a Beach Ambassador!